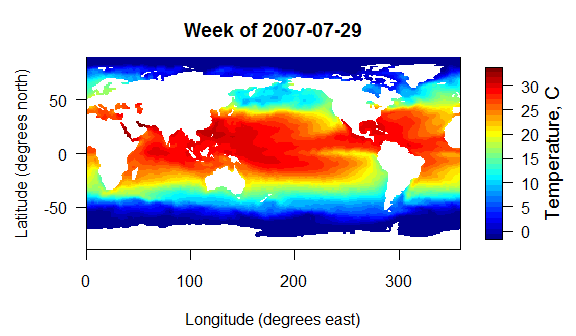 NOAA’s Physical Sciences Division produces a global map of weekly averaged sea surface temperatures, derived from satellite sources. The data can be found at http://www.esrl.noaa.gov/psd/data/gridded/data.noaa.oisst.v2.html. I’ve put together a R script that will extract data from a region of interest and optionally plot it for you. The input data file is a 135+ MB netCDF file found at the link above. The OISSTv2 data are arranged in a 1° x 1° grid covering the entire world, and a weekly average has been calculated for each grid cell for each 7-day period starting Jan 1, 1990, in the file sst.wkmean.1990-present.nc. You will also want to grab the land-sea mask file lsmask.nc as well. The land-sea mask is necessary to remove the spurious temperature values that fall on the continents. In the script below I use the land-sea mask to simply convert all points over land into NA values in the output matrix. This script makes use of two add-on packages available from the CRAN repositories. First, the ncdf package, written by David Pierce and maintained by Brian Ripley, is used to open the netCDF file and extract the desired data. The fields package, written by Reinhard Furrer, Douglas Nychka and Stephen Sain, provides the tools to plot the data with a color scale bar alongside the plot. # The OISST grid layout is 1 degree latitudes from 89.5 to -89.5 degrees north. # The longitude grid is 1 degree bins, 0.5 to 359.5 degrees east. # The SST values are given in degrees Celsius. # Wednesday of that week), starting at 69395 = 12/31/1989. #for the desired grid cell. #Open the netCDF file for reading. #Extract the data from the netCDF file to a matrix or array called 'sstout'. #longitudes running down the rows, and latitudes across the columns. #the last row being the eastern edge of your search area. #the 3rd dimension. Lat/lon will be arranged the same as the 2D case. #sst values in the sstout array, should you need to access them. # continent areas into NA's. #Now we can produce a plot of the data.